Goathland, and Glendale House, make the ideal base from which to follow the Captain Cook Trail. 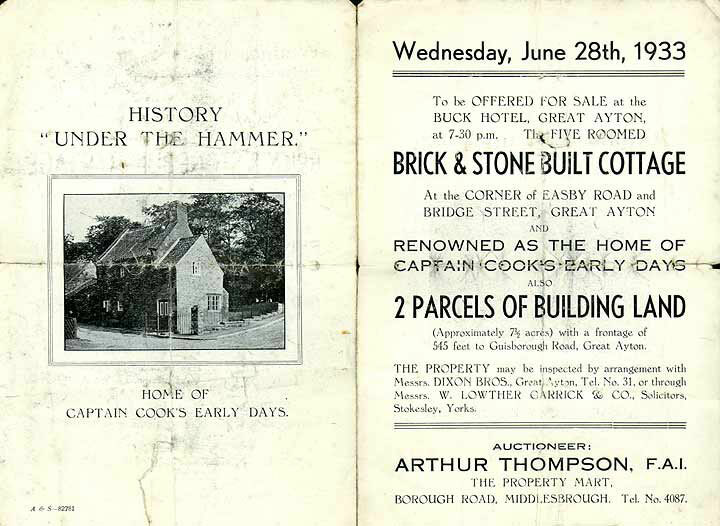 All of the points of interest shown on this page, from his birth place, Marton right through to Whitby, are within 45 minutes of Goathland by car. The name James Cook or Captain Cook, can be seen all over Cleveland and North Yorkshire, and there are pubs, streets, parks and shopping centres bearing his name. In 2003, Europe's most modern hospital opened in Middlesbrough, under the name of James Cook University Hospital. James Cook was born in 1728 in the village of Marton,now a suburb of Middlesbrough. This is where the Captain Cook Birthplace Museum now stands, in the grounds of Stewart Park, and a granite urn marks the spot of the actual cottage where he was born. Captain James Cook was one of the world's finest explorers and navigators, who in 1768, sailed on the Endeavour, and in 1770 was the first European to sight, explore, and chart Australia's east coast. He named the land he found "New South Wales", and claimed it for Britain and King George III. When Cook was 8 years old, his father found work in the nearby village of Great Ayton, where James Cook went to school. The school room is now the Captain Cook School Room Museum. A huge commemorative obelisk was erected in 1827, high on the moors above the village. At the age of 16, James Cook went to work in a general store in Staithes, a small fishing port on the coast, but probably better known for its smuggling. It was here that Cook began his fascination with the sea, after listening to tales of the sea from the village's fishermen. Many relics of his life in Staithes are on display at the Captain Cook & Staithes Heritage Centre, including books, street scenes and pictures. In 1746 at the age of 18, Cook left Staithes and went to Whitby where he became an apprentice to John and Henry Walker, owners of coal ships plying the East coast to London. In 1755 James Cook joined the Royal Navy as an able seaman, and within 2 years became a Master. He was commissioned Lieutenant for the 1st voyage in 1767, and promoted Post-Captain in 1775. On 27th October 1728, James Cook was born, one of five children born to a Scottish Farm worker and his locally born wife. The cottage in Marton, Middlesbrough, was in the grounds of what is today, Stewart Park. The cottage itself fell into disrepair and was demolished, but the site is marked with a commemorative granite urn. He was baptised at St.Cuthbert's church in Marton, where today, his name can be seen in the church register. The entry reads: “James ye son of James Cook day labourer baptised”. In 1978, on the 250th anniversary of Cook's birth, the Captain Cook Birthplace Museum was opened, only yards from the granite urn that marks his birth place. At the age of 16, James Cook went to work for a Mr.Sanderson, who had the General Store in Staithes. Staithes is a tiny little fishing harbour village well hidden in a bay at the base of the cliffs, and at the time was better known for its smuggling, rather than its fishing. He worked all day in the store, and slept under the counter at night. Any free time he had was spent listening to the fishermen's tales down by the harbour, or outside the “Cod and Lobster”. So began his fascination with the sea, and in 1746, Sanderson, recognizing that Cook was not suited to shop-keeping, introduced him to John Walker, a Whitby ship owner who took him on as an apprentice. Housed in the old Methodist Chapel, is the Captain Cook & Staithes Heritage Centre. The ground floor houses extensive displays of lives of the past residents of Staithes with particular reference to the Fishing Industry. Whilst the upper floor is crammed with literally hundreds, if not thousands, of exhibits from the life and voyages of Captain James Cook. The coal ships, owned by Walker and his brother, sailed mostly between Newcastle and London, but occasionally visited Norway, the Baltic, and Ireland. The Walkers owned a house in Grape Lane, now the Captain Cook Memorial Museum, where James Cook lodged in the attic. It is said that while he lodged there, the family’s servant, Mary Proud, soon took a shine to James, supplying him with candles so he could study well into the night.While he was working on the ships, he studied Algebra, Geometry, Trigonometry, Navigation and Astronomy - all skills he would need to one day command his own ship. Whitby was a bustling sea port, and the harbour was full of marine traffic. In winter, when the ships were kept ashore by the weather, Cook helped to overhaul and re-fit the boats in amongst his studies. All Captain Cook's four ships - Endeavour, Resolution, Adventure and Discovery were built at Whitby. After several sea voyages, he joined the Royal Navy in 1755. His capabilities were recognised, and within four years he became a master. He was promoted to Captain in 1775 thus, he was to embark on his famed voyages of discovery with his Whitby flat bottomed "Endeavour". In 1762 he married, and moved to the Mile End Road in London's East End. Grape Lane is where you can find the Captain Cook Memorial Museum. 1763 - 1767, Cook began surveying the coast of Newfoundland and Labrador, and spent the winters at home preparing his charts, which gained him a reputation for accuracy. In 1768 the Government were looking for a man to command a ship for a cruise to the Pacific with the object of observing the transit of Venus. Venus was due to pass in front of the sun - a rare event that can be used to measure the distance of the sun to the earth. James Cook was the ideal man for the post; he was given a ship, the Endeavour, and with a company of eighty-five set sail from Plymouth in August 1768, for the first of his three great voyages. Cook sailed down to 40° latitude but found there was no land. In accordance with his instruction he turned and headed towards New Zealand, which had previously been 'discovered' by the Dutchman Abel Tasman, but was also told to search for terra australis incognita (the un-known southern land).In 1770, the Endeavour reached Botany Bay, and on 26th August, Cook claimed the land for Britain. In 1772, on a new expedition, James Cook commanded the Resolution and was accompanied by the Adventure. The two ships headed for the Cape of Good Hope. They travelled south, crossing the Antarctic Circle in January 1773. They continued to New Zealand, and explored the South Pacific. The two ships lost contact, and the Adventure returned to England, becoming the first ship to circumnavigate the world. After Cook's death, the British Government were looking for an alternative penal settlement after losing the American Colonies in the American Revolution. Settlement in Australia began in 1788 with the arrival of Captain Arthur Phillip. He came across a perfect natural harbour which he named after the then Home Secretary, Lord Sydney. The transporting of British convicts began. Cook was a practical seaman, who understood the importance of vitamin C to maintain the health of his crew, but on his third and final journey, in command of the Resolution, he did not deal so well with the Hawaiians he encountered when he landed on their island . Misjudging the situation, he took their king hostage, after some hostility. Then during a brawl in another part of the island, one of the Hawaiian chiefs, Chief Kalimu, was killed by one of Cook's party. News of this reached the king just as Captain Cook was leading his hostage down to the Resolution. The Hawaiians had by now started to distrust Cook's intentions, and attacked the English group. Cook remained aloof from the fighting, until one warrior crept up behind him and hit him on the head with a large club. Other warriors then joined in attacking him with daggers, causing him to fall in the water. Cook managed to get his head up again, but another warrior gave him a shattering blow - and Cook went down for the last time. An full size replica of HM Bark Endeavour, built in Australia, has berthed in Whitby Harbour on several occasions. Today, the ship Grand Turk, used in the ITV "Hornblower" series, is usually berthed on the Endeavour's moorings. A small replica of HM Bark Endeavour, only 40% in length, built by Parkol Marine in Whitby, still takes visitors out of the harbour and into the North Sea (but not very far). Whitby has other famous connections as well as Captain Cook. Count Dracula is said to be buried in the Church yard, and Bram Stoker, based much of his Dracula novel here whilst staying in Whitby in 1890. Because of the Dracula influence, Goths from all over the country arrive in Whitby for a twice yearly festival, usually in April and October. Charles Lutwidge Dodgson (better know as Lewis Carroll) also set some of his work and poems in Whitby. In 1875, the famous Whitby Photographer, Frank Meadow Sutcliffe, set up his studio in a disused jet workshop in Waterloo Yard. His sepia photographs, almost entirely of Whitby can be seen all over the world, and his entire collection can be seen at the Sutcliffe Gallery on Flowergate, Whitby. Although the photographs are from a much later date, they still give an idea of what Whitby must have looked like in Captain Cook's time.